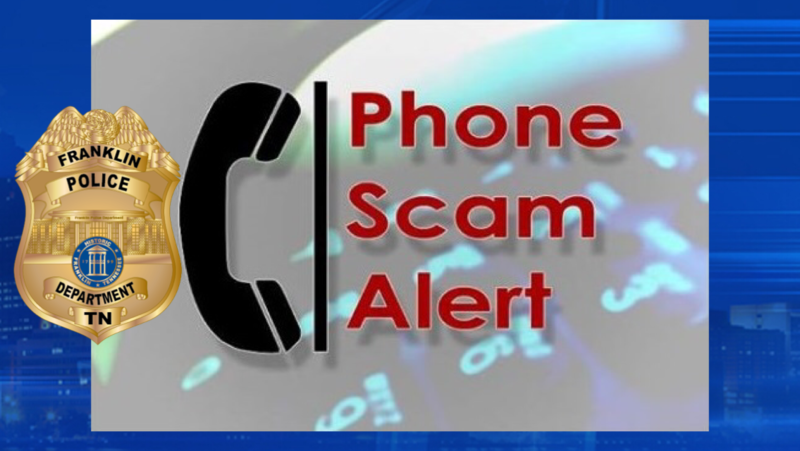 Fraud Alert: Scammers are calling around today, using the Franklin PD’s phone number (615) 794-2513, and alleging that a friend or loved one is in jail and in need of bond money. are spoofing our number onto your caller ID. The FPD will never call you to arrange for bond – NEVER. If you receive one of these calls, don’t give them a dime or your time – HANG UP! 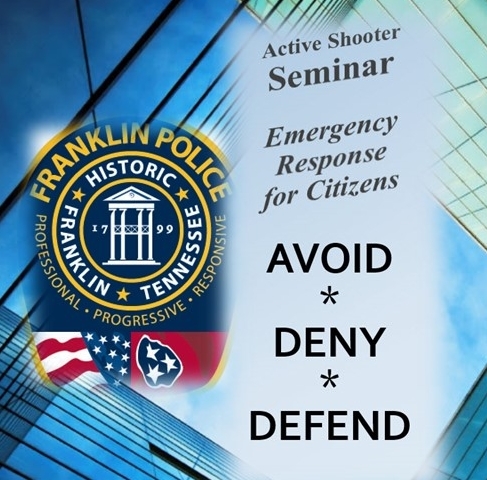 If you have fallen victim, call Franklin Police to speak with an Officer to file a report. With Black Friday just around the corner, Franklin Police will initiate a security plan designed to safeguard shoppers, deter crime, and arrest criminals at Franklin’s shopping venues. 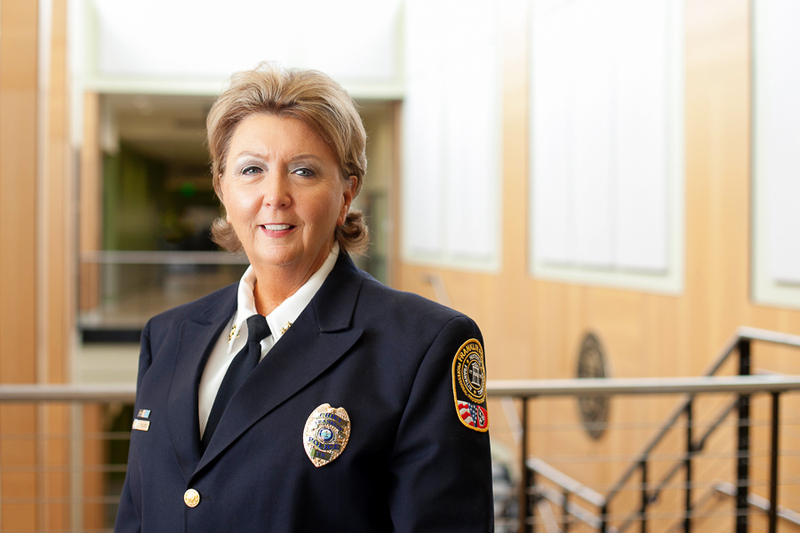 “Franklin Police Officers assigned to the city’s shopping districts will have zero-tolerance for crime and criminals,” said Chief Deborah Faulkner. 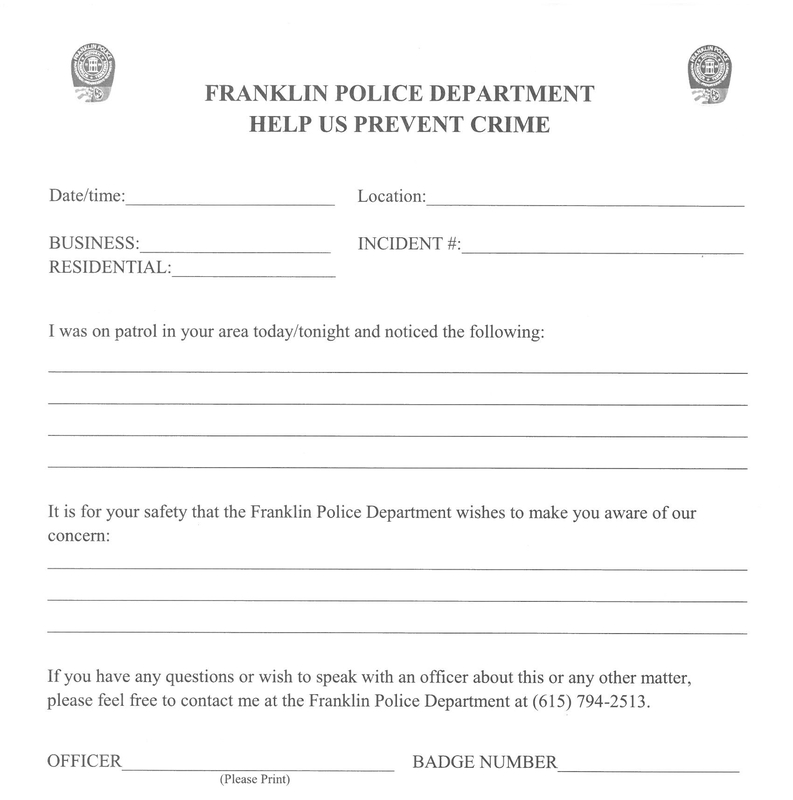 “Our officers are committed to keeping Franklin safe for Franklin residents, visitors, and businesses.” Click for more crime prevention tips from the Chief. An increased combination of highly-visible patrols by uniformed officers in marked cars and plain-clothes officers in unmarked vehicles will be paying special attention to Franklin’s shopping districts between now and Christmas. Franklin Police will work closely with the District Attorney’s Office to ensure shoplifters, identity thieves, auto burglars, and other criminals who take advantage of this busy time of year are prosecuted to the full extent of the law. 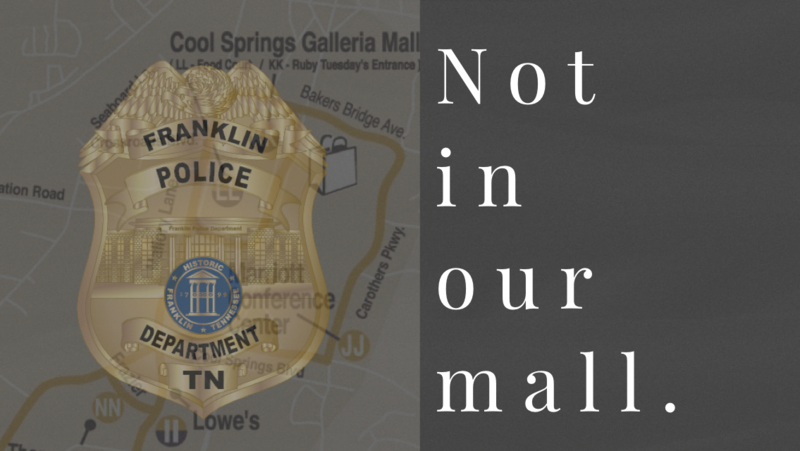 Starting Friday, the Franklin Police Department will staff a temporary command post at the CoolSprings Galleria through the remainder of the Christmas shopping season. Remember to park smart! Thieves love crowded parking lots, and are known to randomly check door handles for unlocked car doors while peering into windows to see what’s inside. Even if you lock your car doors, when crooks see valuables inside, they often force entry by breaking a lock or window. Once inside, thieves push the trunk release to check for purses or other stowed valuables. Police recommend never leaving purses or other valuables in a parked car. Officers on patrol who see something that could put you or your valuables at risk may leave this form to let you know they were there, and to share suggestions on how to increase your safety and security. Safeguarding a community is everyone’s responsibility, and citizens play a big role in deterring crime. Crime prevention is most effective when citizens and the police work together. Let us keep an extra eye on your home. While many are gearing up to travel this holiday season, Franklin Police Officers want to offer you a little extra peace of mind. While you are away, neighborhood officers will help keep an extra eye on your home. To take advantage of this free service, complete the online form. Need additional assistance? Call (615) 794-2513. For many, home is a place of love, safety, and comfort. For millions, though, it’s anything but. According to the U.S. Department of Justice, about 1.3 million women and 835,000 men are victims of physical violence by a partner every year. 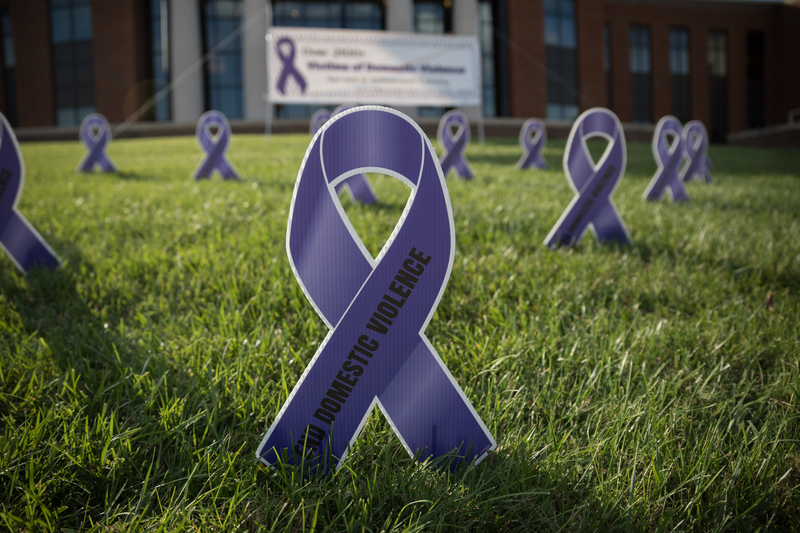 October is Domestic Violence Awareness Month, and the display on the lawn at Franklin Police Headquarters symbolizes the Department’s commitment to helping victims. Domestic violence perpetrated on an individual is a crime against our entire community. 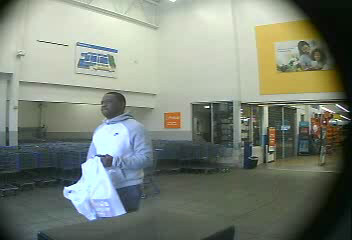 For help, call Franklin Police: (615) 794-2513. For shelter information, call (615) 599-5777 or click. For the latest domestic violence statistics, visit www.domesticviolencestatistics.org.